Despite the fact that Dr. Lawrence Barnes is not afraid of blood, he doesn’t kick stray dogs and is not even close to being as curmudgeonly as Dr. Martin Ellingham, a.k.a. Doc Martin, “Doc Barnes” is leading a seemingly familiar mid-20th century doctor’s life to his fictional counterpart. Working surgeries between the two fishing villages of Cawsand/Kingsand and Torpoint, Barnes still makes house calls, much like Portwenn’s Dr. Ellingham, he can be seen daily walking from appointment to appointment, doctor’s bag in hand, because the streets are too narrow for a motorcar. Dr Barnes says that as he passes people on the street, they’re likely to nod and say, “Hello, Doc”, adding, “That’s when you feel like you’re stepping back in time.” Let’s hope he has better luck with assistants. What has he had now, four in four seasons? And, let’s hope the culinary choices exceed Portwenn’s finest, owned by Bert Large (Ian McNeice), the county’s finest plumber. Needing a Doc Martin fix? 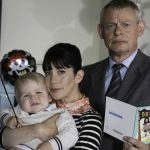 A reminder to Doc Martin fans, the series, starring Martin Clunes and Caroline Catz, will return for a fifth series this Fall on ITV in the UK and, most likely, Spring 2012 in the United States on public television stations. I have loved this whole series–the plots, the characters, everything about it. I really look forward to the new series. And, P.S., I’ll even watch the reruns if and when they are posted. Thanks for the Doc Martin series. As a widow who lives with two cats, whenever I see any of the Doc Martin reruns (like Ellen, when and wherever I find them) I feel better about life. In my opinion this is perhaps the best comedy/drama series ever made. Please keep it going beyond the fifth series–it simply mustn’t stop there! Looking forward to more Doc Martin! Love Doc Martin, am so glad that a 6th season is going to be filmed! We truly love it and all of the characters. We live in the US, and this is a glimpse for us of what a simpler way of life could be like with all of the charms of the seaside village and also the small town follies involved in day to day life, we’re hooked!! Can’t wait for the 6th season to come. Found this series accidentally and fell in love with the program. Hope to see more of Doc Martin.